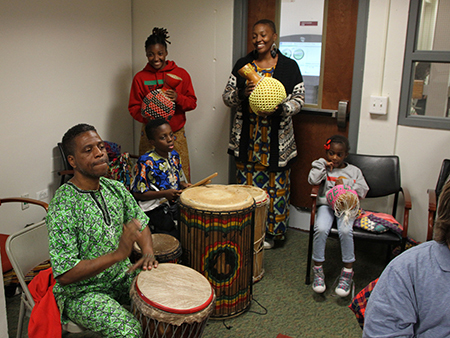 Students and teachers from the Garvey School, who performed in November during International Education Week, will return for a drum performance at the opening ceremonies for Black History Month on Feb. 1 in the Student Center cafeteria. West Windsor/Trenton, N.J. – "Celebrating Accomplishments" is the theme for Mercer County Community College’s (MCCC’s) annual observance of Black History Month in February. The college will host a number of special events throughout the month with themes of history, fellowship and inspiration. Most events will take place on MCCC's West Windsor Campus, 1200 Old Trenton Road. The closing ceremonies will be held at the James Kerney Campus in Trenton, 102 N. Broad Street. The celebration kicks off with an opening ceremony and film screening on Thursday, Feb. 1. The ceremony features the Garvey School Drummers, who will perform at noon in the West Windsor Campus cafeteria. A free luncheon will be served. At 3 p.m., the film Fruitvale Station will be shown in BS209, with a discussion to follow. On Saturday, Feb. 3, a Benefit Variety Show will feature current MCCC students and alumni performing song and dance numbers, including tap dance. The show starts at 3 p.m. at Kelsey Theatre. The community is welcome. Tickets are $10 and may be purchased at the Bursar’s Office (SC256) or at the door prior to show time. All proceeds will go to the MCCC Book Scholarship Fund. On Thursday, Feb.8, the Mercer EOF program will present a Black History Month discussion, starting at noon in CM107. (Details to come.) Also on Feb. 8, a screening of the film Marshall takes place at 3 p.m. in BS209, with a discussion to follow. On Thursday, Feb. 15, a screening of The Wiz takes place at 3 p.m. in BS209, with a discussion to follow. On Tuesday, Feb. 20, a panel discussion entitled “The Role of the Black Church” will feature MCCC faculty and pastors from local churches. The program starts at noon in CM107. On Thursday, Feb. 22, a screening of the recently released Netflix film Mudbound (2017) takes place at 3 p.m. in BS209, followed by a discussion. On Saturday, Feb. 24, a Gospel Play will be presented at Kelsey Theatre, starting at 3 p.m. The play features four church sisters, accompanied by the Beauty Grove Primitive Baptist Church Praise Choir. The community is welcome. Tickets are $10 and may be purchased at the Bursar’s Office (SC256) or at the door prior to show time. All proceeds will go to the MCCC Book Scholarship Fund. The event is co-sponsored by the MCCC chapter the American Association for Women in Community Colleges. The Student Life and Leadership Office joins in the celebration on Tuesday, Feb. 27 with a Black History Month Trivia Game Show. Students are invited to test their knowledge for fun and cash prizes, starting at 11:45 a.m. in the cafeteria. For more information, contact Lucia Brown-Joseph at brownl@mccc.edu.